"Get your wing out of my face!" Bruce said to the butterfly flying next to him. "Would you mind taking your antenna out of my wing!" he asked another. 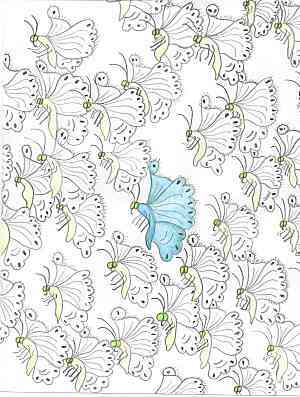 "It is too crowded here," he said, flapping his wings and aiming higher in the sky, above the rest of the rabble of butterflies. "There," he sighed. Bruce looked down at the group below him. "Finally I can fly without bumping into anyone." The butterflies were heading to southern Scotland, to a warmer climate. Autumn was in full swing up north and the temperature was dropping quickly. "We all look the same," Bruce said. "I see nothing but pale green bodies and white wings. What a boring group we are." Bonnie, another butterfly, had been watching where Bruce was going and flew towards him. "Bruce, you should stay with the group. There is safety in numbers and besides; we’re headed for a storm. Look," Bonnie said, pointing to the puffy clouds up ahead. "They are kind of dark, aren’t they?" He heeded Bonnie’s warning and the two flew back down, joining the others. When the rain began, the soft drops pelted the butterflies. Rain ran into their eyes, down their antenna, and gathered on their wings. It rained for hours. "This is tiring," complained Bruce. "The water feels heavy on my wings. Is this ever going to end, or is our whole migration going to be like this; wet!" "I’m sure it will end soon," Bonnie smiled. "Get your leg out of mouth," Bruce yelled at another butterfly, pushing it away. The next few hours went much the same. Rain and complain. Rain and complain. Finally the clouds parted and the rain stopped. "Wow! Look at that rainbow!" he called. "It is beautiful," Sun-Li replied. "Look at the colors. They remind me of summer flowers." "I wonder what its like to fly through a rainbow," Bruce said. "I think I’ll find out," he said, flying up towards the rainbow. "Bruce, come back here," Bonnie. Bruce ignored her and kept flying. When he reached the rainbow, he flew through it. "Wow! This is cool!" He could feel the tiny drops of water that made up the rainbow and felt the sun’s warmth on his delicate wings. Bonnie watched from below as the group flew on. Bruce looked down and saw the others far ahead. "Oops. I’d better go." He flapped his wings and caught up with Bonnie. "Bruce! What happened to you?" she gasped. "What do you mean? What happened to me? Is something wrong?" he asked. "Bruce, you are blue. Look at your wings and your body," she replied. He looked at his wings. "I am blue. I must have picked up some of the color from the rainbow. I thought the blue was pretty, so I flew in and out of it." Bonnie thought about what he’d said. "You mean if I fly up to the rainbow, I’ll not be plain old white any longer? I can be another color?" "I guess so. It happened to me. Why not to you too?" Bruce said. "Don’t let the others go on without me. I’ll be right back," she said and flew towards the rainbow. "You must hurry, Bonnie. A rainbow only lasts a few minutes. If you don’t fly through it quickly, you’ll not be colorful," Bruce warned. She flew into the rainbow. Her wings flapped up and down as she fluttered in and out of the beautiful arc. When she flew back to the others, Bruce said, "Look at you! You’re pink." Soon some of the other butterflies noticed Bruce and Bonnie. "How did you two turn blue and pink?" Blaire asked. "We flew through the rainbow. It must be magical or something because we aren’t white any longer," Bonnie laughed. "Come on," Blaire called to the others. 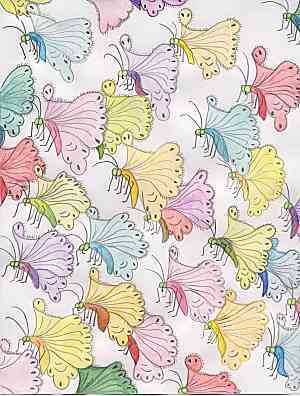 Soon the whole rabble of white butterflies was flying in and out of the rainbow. "Whee! This is fun," he squealed. A few minutes later the rainbow disappeared. Some butterflies were brightly colored. They’d been the first ones to reach the rainbow. The stragglers came back in pale shades of green, blue, pink, orange and yellow, but they were still all beautiful. "Look at us now!" Bruce cried out. "We’re all different and we’re all pretty! Some of us are darker shades than the others." That night they arrived at their destination. 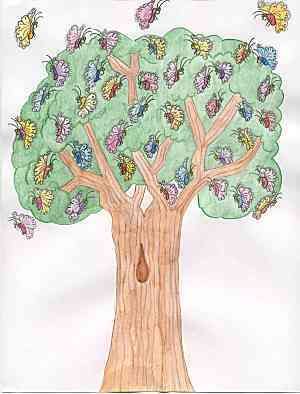 The tired butterflies landed in a tree, thankful to rest. It was covered with thousands of bright green leaves. Jackie, a small boy, and his mum walked down the path and spotted the tree. "Look, Mummy. The tree is covered with hundreds of different colored flowers!" They walked up to the tree to get a closer look. "Those aren’t flowers. Those are butterflies," his mum said. "I’ve never seen anything more beautiful in my life. We must go and tell the others in the village, so they can come and see it." Jackie and his mum ran to the village. Soon all the people were standing around the tree. "What happened to the white butterflies that usually come here each autumn? Where are they?" "It doesn’t matter, Mummy. These ones are much prettier," Jackie said. Bruce smiled at Bonnie. He was happy that he was blue, instead of white. Bruce looked at the tree. It was beautiful. He looked at Bonnie’s wings. They were beautiful. He looked at his wings. He was beautiful too. And then he closed his eyes and went to sleep, happy to be somewhere warm!